You are not your loved one’s doctor, but you suspect that something may be wrong. Given your loved one’s age and known medical conditions, it is important for you to take action quickly if you suspect that your loved one is suffering from pneumonia. Cough—especially a cough that produces yellow or green sputum. One or more of these symptoms may be a sign of pneumonia, and it is important to take action quickly even if you aren’t sure what is causing your loved one to suffer a particular symptom. A symptom is not the same as a diagnosis. Instead, it is a clue that should cause you to take further action. If your loved one has any of the symptoms described above, or any other symptom that is causing you concern, then you should make sure that your loved one is seen by a doctor as soon as possible. A medical provider may be able to quickly diagnose pneumonia by listening to your loved one’s lungs and ordering a chest x-ray or CT scan. 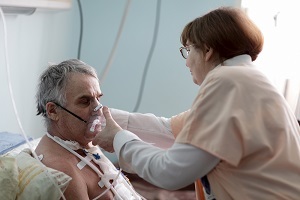 If a doctor confirms that your loved one is suffering from pneumonia and you believe that the pneumonia was caused by nursing home neglect or that the nursing home failed to recognize the symptoms of pneumonia in a timely manner, then it is also important to speak with a nursing home injury lawyer as soon as possible. Our attorneys would be pleased to provide you with a free consultation and to help you protect your loved one’s rights. For more information please call us today and download our free report, Fighting Back Against Nursing Home Abuse: What Families Need to Know to Protect Their Loved One. My loved one died from pneumonia in a nursing home. Could I have a wrongful death case?